Oh Hell Scorekeeper makes keeping score for a game of Oh Hell easier than ever before. It’s also designed to help newcomers learn the game, with easy-access help at every stage of the game, from entering player names to dealing, bidding and scoring. Oh Hell is a game played under many different names – Wikipedia lists over 70! Some of the more popular are Nomination Whist, Up and Down the River, Oh Pshaw, Oh Heck, Swing 13, Riki Tiki, La Podrida, and many more. There are many variations to the gameplay, and I’ve included the ability to select many of these in this app, under “Options”. If you need another option not already included in order to play the game your favorite way, please email me and I’ll do my best to update the app with options needed to play it your way. 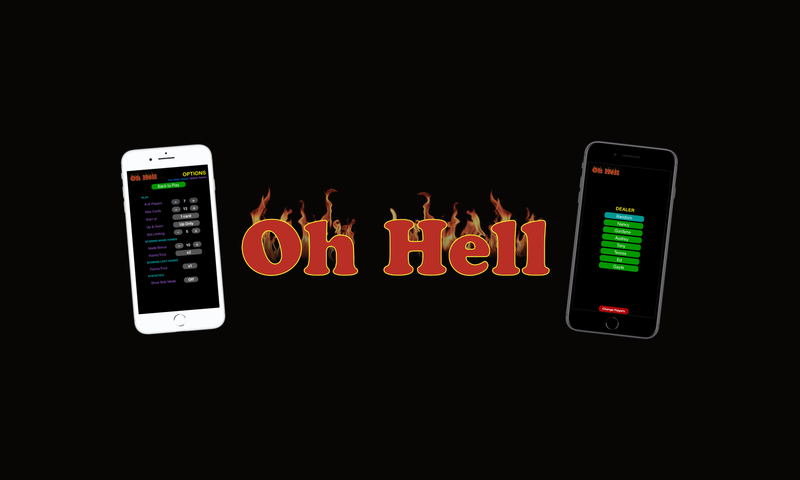 There are a number of Oh Hell sites online where you can learn more about the game, including rules and variations as well as other scoring apps. Jan Adamec’s Oh Hell Scoring is nicely laid out for the iPad and inspired me to write Oh Hell Scorekeeper for the iPhone. Please feel free to email me with questions or requests at nancy@nangeroni.net.